Alzheimer’s disease is the most common form of dementia which is defined as the loss of cognitive functioning and behavioral abilities. Like all types of dementia, Alzheimer's is caused by brain cell death. It is a neurodegenerative disease which leads to progressive brain cell death that occurs over a period of time. A variety of suspected causes are being investigated including factors in the environment, biochemical disturbances and immune processes. At present there is no cure for Alzheimer's disease but there is a worldwide attempt under way to find better modes to treat the disease, to delay its onset, and to prevent it from developing. 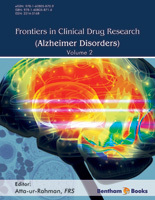 The book series, “Frontiers in Clinical Drug Research – Alzheimer Disorders”, is intended to present the most notable developments in the field in the form of cutting edge reviews written by leading experts. Volume 2 of this eBook series is a compilation of five well written chapters contributed by some of the most prominent researchers in the field. It contains new therapeutic strategies, clinical drug research and development, evolving techniques of volumetric measurement of the hippocampus, and implications for possible therapeutic targets and environmental impact on the etiology of Alzheimer’s disease. Baloyannis in Chapter 1 describes the ultrastructural modifications of the cerebellar cortex in the early onset of AD and focuses the study especially on mitochondria, Golgi apparatus, dendritic branches, dendritic spines and synapses in the cerebellar hemispheres and the vermis. The review concludes that on the basis of the mitochondrial and Golgi complex pathology, new therapeutic strategies protecting those organelles might be planned for the treatment of AD, particularly at its early stages. Chapter 2 by Zhang et al. reviews the major pathological features and hypotheses in Alzheimer’s disease (AD). Moreover, the current available drugs and their applications are described in this review. The potential drugs in clinical trials and under advanced stages of development are also introduced. Volumetric measurement of the hippocampus is currently an emerging area for a number of neuropsychiatric disorders. The volumetric analysis of the hippocampus in Alzheimer’s disease plays an important role in pathophysiology of this neurological disorder. Dhikav et al. in Chapter 3 introduce methods for estimating the hippocampal volume loss in Alzheimer’s disease. Daulatzai in Chapter 4 comprehensively describes the synergistic pathophysiological factors that may underlie the onset and progression of cognitive dysfunction. This review provides details of the multifactorial pathologies that promote inflammation and enhance vulnerability to Late-Onset Alzheimer’s disease. Possible therapeutic targets are also discussed. Epigenetic mechanisms are involved in learning and memory. Most of the biological pathways dysregulated in AD are controlled through epigenetic modifications. The environmental impact on the etiology of Alzheimer’s disease is extensively reviewed by Benassi and Consales. This review explains that the role of neuroepigenetics in classifying new aspects and novel therapeutic strategies for the treatment of Alzheimer’s disease. This second volume of the book series represents the results of a considerable amount of work by many eminent contributors. I wish to thank them all for their excellent contributions and their commitment to complete the writing assignments in time. I also wish to thank the excellent team of Bentham Science Publishers, especially Ms. Fariya Zulfiqar, led by Mr. Mahmood Alam, Director Bentham Science Publishers, who deserve all appreciation.